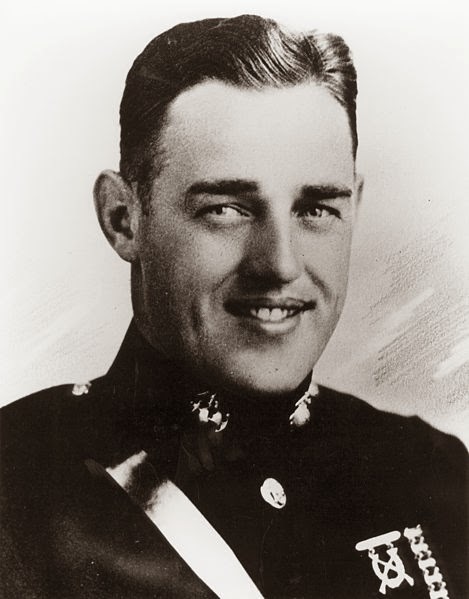 "For extraordinary courage and heroic conduct above and beyond the call of duty as Commanding Officer of Company C, First Marine Raider Battalion, during the enemy Japanese attack on Henderson Field, Guadalcanal, Solomon Islands, on September 12–13, 1942. Completely reorganized following the severe engagement of the night before, Major Bailey's company, within an hour after taking its assigned position as battalion reserve between the main line and the coveted airport, was threatened on the right flank by the penetration of the enemy into a gap in the main line. In addition to repulsing this threat, while steadily improving his own desperately held position, he used every weapon at his command to cover the forced withdrawal of the main line before a hammering assault by superior enemy forces. After rendering invaluable service to the Battalion Commander in stemming the retreat, reorganizing the troops and extending the reserve position to the left, Major Bailey, despite a severe head wound, repeatedly led his troops in fierce hand to hand combat for a period of ten hours. His great personal valor while exposed to constant and merciless enemy fire, and his indomitable fighting spirit inspired his troops to heights of heroic endeavor which enabled them to repulse the enemy and hold Henderson Field. He gallantly gave his life in the service of his country." From Major Kenneth D. Bailey's Medal of Honor citation on March 24, 1943. Any chances of seeing heroes from the other allies as well in this Monday feature? I was thinking about it but need to find the resources and histories before I do it for both the Allies and Axis.